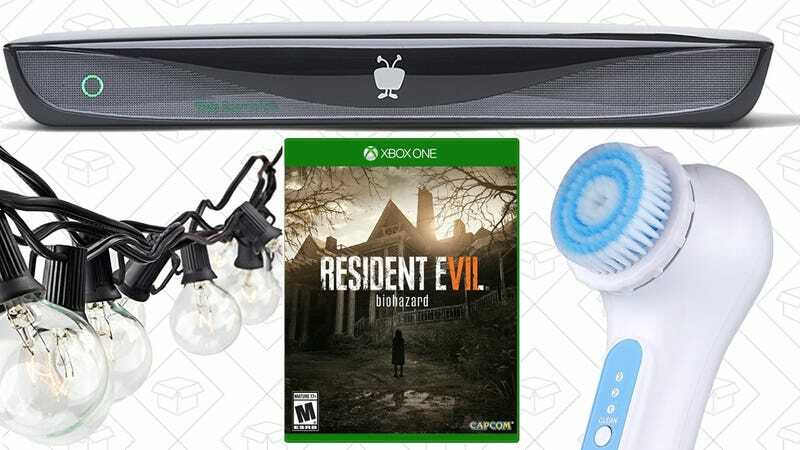 Resident Evil 7, the best value in chef’s knives, and a TiVo without service fees lead off Thursday’s best deals from around the web. The TiVo for cord cutters comes with lifetime service and a 1TB hard drive, and Amazon’s offering one of the best deals we’ve seen on it today. The Roamio OTA doesn’t have a slot for a cable card; it’s designed specifically for use with an OTA antenna, meaning cord cutters can still enjoy a top-flight DVR experience for network broadcasts. The original model is usually sold for $50 with a 500GB hard drive, but you had to pay $15 per month for the TiVo service. 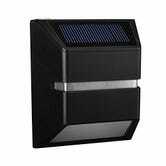 The new model though comes with 1TB of space, and usually retails for $350-$400 upfront, with lifetime service. Assuming you’ll use it for more than a couple years, that’s a good deal on its face, but Amazon’s knocking it down to just $305 right now, while supplies last. USB-C will take over the world before long, but in the meantime, you’ll want some USB-C to USB-A cables to ease the transition. 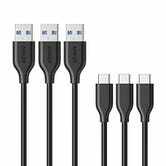 Get three reader-favorite Anker PowerLine cables for $10 with code SDUSBC33. 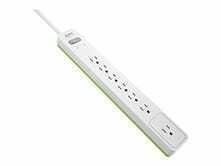 APC 6-Outlet surge protector with phone protection, $7 after $3 coupon | Also available on 7-outlet model without phone protection. 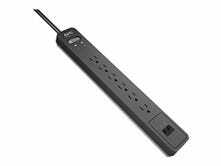 Death, taxes, and not having enough power outlets are unavoidable constants in life, but you can at least do something about one of them. Just be sure to clip the $3 coupon. If you have an old hard drive or SSD lying around, you can convert it to exteranl storage with a couple of deals today. Functionally, the case and the cable should work the same, but I think the cable looks really cool. As I mentioned in my guide to the best external drives for your PS4, building your own external is a cost-effective way to improve your loading speeds with a 7200 RPM drive. If you can’t wait to get your grubby little fingers on the new MacBook Pro with Touch Bar, you can get the 256GB 15" model for $300 off today on eBay, with no sales tax for most buyers. Unlike the 13" model, this one includes a discrete AMD Radeon 450 GPU, and while it’s still an expensive machine any way you slice it, this is the best discount we’ve seen so far. 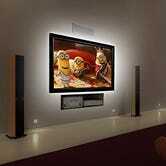 If you still haven’t tried out a home theater bias light, there’s never been a better time to pick one up. Kohree’s LED bias light strips plug directly into your TV’s USB port for power, and stick to the back of the set via built-in adhesive. 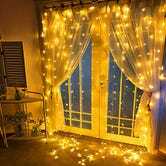 Once you turn your TV on, the LEDs cast a soft glow on the wall behind them, which can reduce eyestrain when watching in the dark, and improve your TV’s perceived black levels. 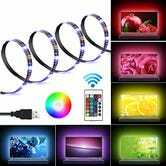 For a limited time, you can get either a white strip or an RGB model for the same $10 price. Just be sure to note the promo codes. 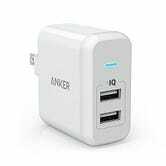 Anker’s PowerPorts are your favorite USB charging hubs, and they’re practically giving away the travel-friendly 2-port model today. Just use code NL2SYSY4 at checkout to get it for $7. It’s a bit larger than the Aukey power brick that we’ve posted in the past, but it’s capable of outputting 12W on both ports simultaneously, rather than splitting that power between them. Need more ports? 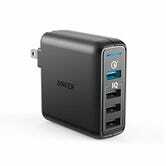 The PowerPort Speed 4 includes Quick Charge 3.0, and is also on sale for $24. 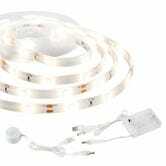 Extra 10% off electronics. Maximum $100 discount. Ebay’s running another wide-ranging discount today, this time offering 10% off (max. $100 discount) on TVs, tablets, unlocked smartphones, and other electronics when you spend $200 or more. You can find all of the eligible items here, just note that you’ll need to use promo code CGAMETECH10 at checkout, and pay with PayPal. Travel Router: Turn any ethernet jack you find into a Wi-Fi hotspot, which can still come in handy at certain hotels and conventions. 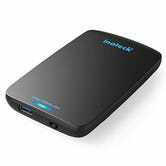 6,000mAh USB Battery Pack: Keep your phone and tablet charged during a long day away from any power outlets. File Hub: Transfer files and wirelessly stream content from an microSD card, hard drive, or flash drive to all of your devices. Imagine loading a cheap microSD card up with movies for a long trip, instead of, say, buying an expensive iPad with more local storage. 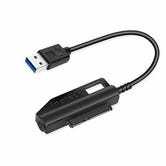 Today on Amazon, you can knock $5 off the price of the FileHub with promo code DWZ73QET. We aren’t sure how many they have in stock, or how long the promo code will last, so I’d act fast if you’re interested. If you’re still listening to your TV through its built-in speakers, listen up: This highly-rated Sony sound bar and wireless subwoofer for just $109 as a refurb, nearly $90 less than buying it new. In addition to delivering rich audio from your TV, the sound bar includes Bluetooth so you can stream music from your phone on the fly, and even NFC for easy device pairing. Today’s deal also happens to be the lowest price we’ve ever seen, and nearly $90 less than its usual going rate, so don’t hesitate to pick this up if you’re in the market for a better aural experience from your home theater. If your current phone case has seen better days, you can slip on a new one from Ringke for $4 today. There are too many options to list them all here, but you can find all of the links and promo codes on this post. Anker’s PowerLine cables are our readers’ favorite way to charge, and iPhone owners can upgrade on the cheap today. 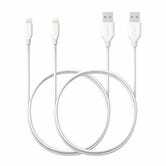 Choose from two 6' cables for $16, or a single 3' Powerline+ cable (which adds a nylon braided exterior to the kevlar-reinforced interior) for $10. USB-C is taking over the world (it might even be in the next iPhone...what?! 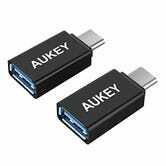 ), and you can ease the transition with a handful of inexpensive USB-A to USB-C cables, or some ultra-affordable plug adapters. To celebrate GDC 2017, Amazon’s taking an extra 20% off select gaming peripherals, PC components, and even complete gaming laptops and desktops today with promo code GDC20. Update: Contrary to common sense, the products on the bottom of the promo page aren’t eligible for this promotion, including the graphics cards, laptops, and SSDs. Sorry for the confusion. Anker, purveyor of your favorite USB battery packs, charging hubs, charging cables, and more, is running another great batch of weekly deals. There are too many deals to list them all here, but head over to this post to see them all. Update: Now up to $40. Victorinox’s Fibrox 8” chef’s knife is one of your favorite chef’s knives period, and by far the best value in the industry. It’s also the knife I’ve used almost every day for almost five years. Amazon has it for $30 right now, which is an absolute steal for the quality you’re getting. There’s no reason to buy a YETI tumbler when you can buy a functionally identical product, plus a ton of accessories, for half the price. $15 today gets you a 30 oz. 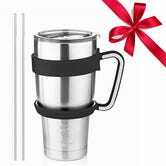 tumbler, two steel straws, a lid, and a detachable handle in the color of your choice. Just use code INFEQN93 at checkout. I figure there’s a decent chance Putin will trigger a nuclear holocaust by releasing Trump’s peepee tape, so it can’t hurt to be prepared with some emergency rations. 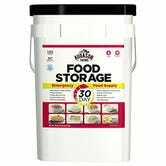 Prime members today can get a bucket with a month’s supply of food for $84, an all-time low. Just add water, and you’ll enjoy meals like “creamy chicken rice,” “elbow macaroni,” and “hearty vegetable chicken soup,” all of which are delicious, I’m sure. 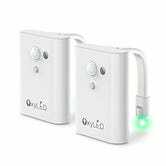 Our readers have purchased thousands of under-bed and toilet-mounted motion sensing lights, and now you can get a combo pack with both for $27. That’s everything you need to pee at night without stubbing your toe or blinding yourself with overhead lights. Just add both items to your cart, and use code OXY2TN01. Contigo’s Autoseal West Loop travel mugs are a longtime reader favorite, but the similar SnapSeal Byron is marked down to great low prices today on Amazon. You get to choose from either the 20 oz. or 24 oz. model in for this deal, though only in one color. When we post deals on these mugs, it’s usually the West Loop model, but the Byron’s a little bit different. Unlike the West Loop, the Byron’s lid doesn’t open and close automatically, though many reviewers say it’s easier to clean. The Byron also includes a rubberized non-slip sleeve, which is a nice touch, especially at these prices. For a limited time, Target’s taking an extra 25% off hundreds of kitchen appliances and accessories with promo code KITCHEN, plus an additional 5% off for REDCard holders. The promo includes KitchenAid mixers, Ninja blenders, coffee makers, and a whole lot more, but some popular items (like the Instant Pot pressure cooker) are already sold out, so you’d better hurry. 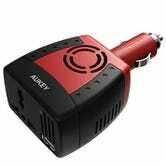 Everyone should keep an inverter in their glove box for powering laptops and other electronics in the car, and this 150W model from Aukey should be sufficient for almost everyone. Thousands of our readers have bought Anker’s HomeVac Duo, but today, we have a match for the best price ever on the brand new model. 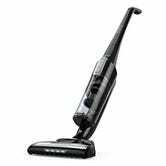 This HomeVac is sold under Eufy, Anker’s new home goods brand, and while it doesn’t include a pop-out hand vacuum like the Duo, it is more powerful as a vacuum. 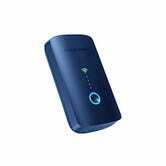 And naturally, since it comes from Anker, it’s completely cordless, and can run for almost an hour in low power mode, or over 20 minutes at the highest setting. It’s a new month, which means a new batch of Prime Pantry free shipping items. You know the drill by now: Add five eligible items to your Prime Pantry box, and the $6 shipping charge will be automatically waived at checkout. Plus, if you already have a Pantry shipping credit in your account from selecting no-rush shipping on a previous order, that will stack, giving you an additional $6 discount. The selection is wide enough that you shouldn’t have any trouble finding five items: Everything from peanuts to shampoo to condoms are included, with tons of categories in between. 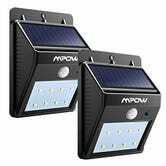 Without any wiring to futz with, Mpow’s solar-powered, motion-sensing spotlights are the easiest way to illuminate your front porch or lawn, and you can get one for $9 today, or buy more and save. Just be sure to note the promo codes in each case. 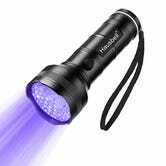 LED flashlights belong in every drawer and glove box, and this zoomable model from Hausbell can be yours for $7 today. 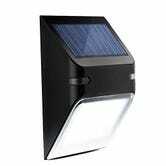 The Hausbell T6-C includes a luminous ring on the base that makes it easy to find in the dark, and a built-in magnet makes it easy to mount so you can keep your hands free. For a while, the Clarisonic Mia was a game changer: a handheld cleansing brush that costs the same as one pricey facial and achieved almost the same results. But right now, you can grab a brush with three speeds, plus a charging stand and extra brush head, for just $28. It may not be Clarisonic, but that won’t matter when your skin feels baby soft. 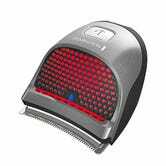 For $46 (after a 20% coupon), the Shortcut Pro can run for 40 minutes on its built-in lithium-ion battery, and includes nine different length combs to customize your look. And unlike most electric trimmers, it’s shaped like a puck, rather than a wand, which makes it much easier to maneuver around the back of your own head. Just note that you won’t see the deal price until checkout. 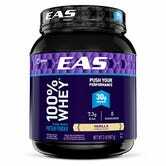 If you still haven’t given up on your new year’s fitness goals, Amazon’s taking 25% off several EAS 100% whey products, including a 2-pound vanilla powder container for a mere $11. Note that the discount won’t be shown until checkout, and that you can get additional savings with Subscribe & Save, but the coupon will also work with standard delivery. Uniqlo U was the brainchild of Uniqlo and Christophe Lemaire. It’s a simple collection with clean lines and a solid palette, and right now, Uniqlo is marking down pretty much every piece. Get men’s and women’s Uniqlo U items for as low as $15 from now until Sunday and up your basics game. Whether you wear TOMS for the ease of never having to tie your shoes or just dig the style, this is one deal you should take advantage of. They’re having their Surprise Sale, with up to 65% off select styles. Plus, they’ve come a long way from just simple, canvas slip-ons. Now you have a real reason to throw out your old, gross ones. Everyone knows activewear that you are actually active in is overpriced. But Lululemon’s We Made Too Much Sale takes those prices into the “I can live with that” territory. Grab up to 60% off leggings, yoga pants, tees, and tanks that will take you from the gym to your couch work and back again. The ice caps are melting and migrating birds are confused, but it’s warm enough to go lay in a hammock in February, so make the most of it. 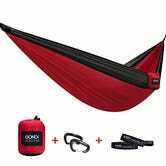 $22 today gets you an ultralight camping hammock, plus two carabiners and tree straps. All you need is a park. If you’ve been eyeing something from Adidas, either for yourself or for the fitness junkie in your life, now’s the time to get it.Use the code ROGERS20 and take 20% off your entire order, plus grab free shipping. Seems like spring cleaning just got a little bit harder. When it comes to having a corner on the market, nothing really compares to Nike. And right now, they’re having giving you 20% off clearance items with the code TAKE20 for both men’s and women’s styles. Check out a bunch of items, from sneakers to running gear, to sweatpants, and hop on that sportswear bandwagon. Star Trek: Beyond was actually pretty good—well, at least better than Into Darkness—and it’s definitely worth a digital rental for $1. Once you order it, you’ll have 30 days to start watching, and then 48 hours to finish once you’ve started. Resident Evil 7: Biohazard is scary as hell (and I’m not just talking about the scary-realistic teeth), and you can pick up a copy for $40 on Amazon, today only. Just don’t play it with the lights off. It doesn’t come with any bundled extras (other than a copy of Minecraft), but $200 is the best cash price we’ve seen on an Xbox One S to date. This deal was available last month from a different eBay seller, but if you missed out, here’s another chance. I’m one of those dummies that paid $500 for a Day One Xbox One, so I’m a little salty about this. The Bluetooth-enabled Xbox One S controller is still on sale for $39, but for $9 less, you can get the old model plus a 9' microUSB cable to connect it to your PC. Logitech’s G602 is more than enough gaming mouse for most people—we’re talking 250 hour battery life, 11 programmable buttons, and per-user programmable DPI settings—and it can be yours for $40 today, matching a deal we saw last month.